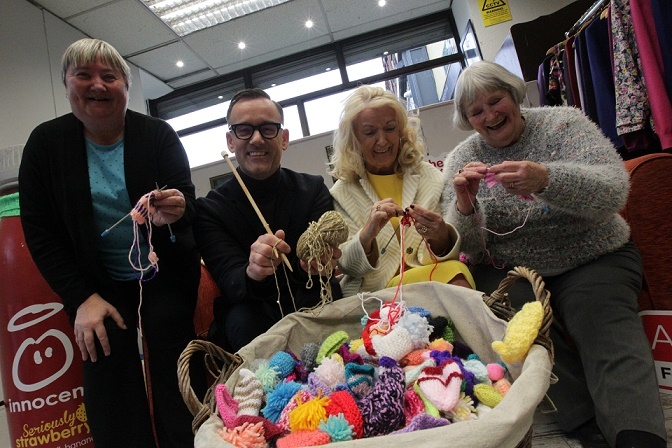 Winnie O’Doherty, Churchtown (right), and Anne Kelly, (left) Inchicore members of the Age Action Camden Street knitting circle helped launch Big Knit 2019 with Age Action and innocent drinks along with Brendan Courtney and his mother Nuala. Knitters around the country are asked to help knit little hats to raise funds for Age Action. For every hat received by innocent, 30c is donated to Age Action, Ireland’s leading advocacy organisation for older people which raises awareness of the valuable contribution older people make to society and advocates for the rights of all older people. innocent drinks Ireland is asking knitters and crocheters around the country to knit 100,000 little hats in a fundraising effort for Age Action. For every hat received by innocent, 30c is donated to Age Action, Ireland’s leading advocacy organisation for older people which raises awareness of the valuable contribution older people make to society and advocates for the rights of all older people. From now until 31 July 2019, innocent and Age Action are calling out to veteran knitters and newcomers alike, to grab their knitting needles and get clacking for this brilliant cause. Brendan Courtney said “Myself and my Mum Nuala are thrilled to be part of the Age Action innocent Big Knit 2019. Knitting circles are popping up all over the country which is a great way to keep communities connected especially when they bring young and old together. The beauty of these little hats is that they don't have to be catwalk standard - just knitted with care for our older friends and family". Over the past ten years the Irish public knitted an astonishing 490,000 hats and helped raise €170,000 for Age Action. Hats can be sent to The Big Knit 2019, innocent drinks, Fruit Towers, 2 Ballsbridge Park, Dublin 4 or dropped into any of Age Action’s shops or offices in Dublin, Cork, Galway and Monaghan.